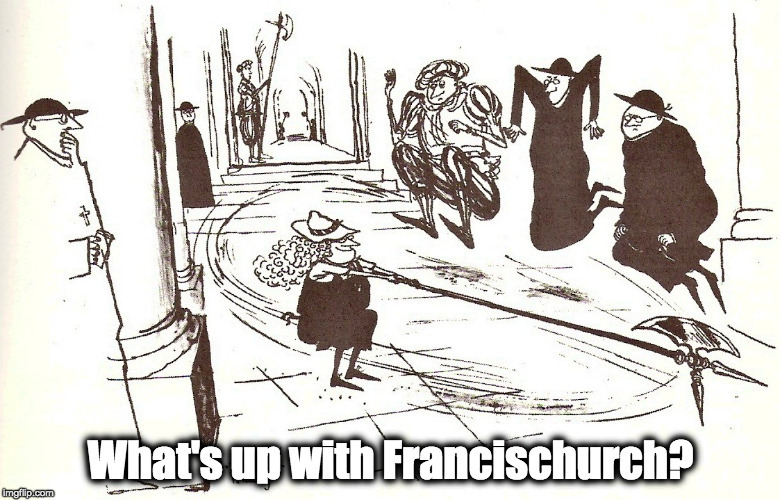 It’s a sin to waste time – swearing off Twitter and turning toward the Lord – What's Up With Francis-Church? I’ve shut down the WUWTS Twitter page. Staring at the wall is literally a more useful way to spend one’s time. So, I’ve been hearing from a number of people who are doing the work of writing and speaking against the current evils, and most of them are saying the same things. We’ve done a good portion of what we set out to do. More repeating of the warnings seems like a waste of time too. I the immortal words of Buffy, Where do we go from here? From the eminent and exalted Fr. Murray to the lowly Steve Skojec, we seem to be aiming more at things we can do than just endlessly repeating the same warnings, kneejerking to the daily horrors. Responding to the news, or even keeping ahead of the events and reporting the news, seems like a good and useful thing to do. Constantly webcrawling over the rotting heap doesn’t. To those who have contacted me about this, I’m starting to have an answer. Yes, it’s important to be involved. Yes, it’s absolutely important to do things like write a letter to your bishop telling him that until certain things are faced squarely your family, your firm, your Knights of Columbus chapter, your Catholic business association… will not be donating another red cent to the diocese, the parish or any “special collection”. A long time ago, when Catholics were upset about the changes being forced onto the Church by these ideologues, people would put an envelope in the collection basket containing a note that said how much you were giving to a local Catholic charity you trusted, instead of the hierarchy. The “Close your wallet” campaign is a heck of a good idea. And other lawful ways – like protesting at gatherings like the USCCB meeting in Baltimore earlier this month, are all good. But these things aren’t going to take up a lot of your time. After the letter is written and posted, the note dropped into the collection basket, even the day spent in a chilly tent in Baltimore, what then? You go home and things external to you haven’t changed. Probably – let’s be honest – won’t change. Not visibly. Not right away. Probably not in my lifetime, in fact. Indeed, I think we can all more or less agree that we expect things to get a good deal worse, starting pretty much right now. We expect that parishes will be sold, the kind of mass-amalgamations that are becoming common across Europe will start being seen in North America too. Public prosecutors are only getting started, and the Vatican boys are more intransigent than ever, as we saw with the incredible appointment of Blase Cupich, of all people, to organise that meeting in February in Rome. In fact, the Baltimore meeting will probably be recorded by Church historians as the beginning of the fall of the Catholic Church, certainly in the United States, and possibly as a domino effect around the world. We’ve certainly been warned often enough by Heaven’s own Queen that if we didn’t change, there would be a period of chastisement. I think there’s no more place to go with all that. It seems to me to be over. More power to Mike Voris and his crew and LifeSite and others who are doing the mucky work of getting the news out. But that’s activism. Activism is useful and good, but only a tiny part of what needs to be done. So, I think it’s time to change track. I’ve been thinking about it for a couple of months, and a few things have become clear. We do need to change track. We need to change our lives entirely. The answer to the question, “Once I’ve sent the letter to the bishop, what do I do?” is as plain as day. It’s time to focus on becoming saints. Are you asking right now, “What’s the Transforming Union”? Are you Googling it? If so, that’s what all this is about. That’s the missing piece. It’s the answer to the first question. It’s what we have to do. When Fr. Gerald Murray and others tell us that we must pray, I think most people literally don’t understand what that means. I think most people think of prayer as, at most and in a vague way, “talking to God.” They think of vocal prayers, the Rosary, the prayer on the back of a holy card, the intercessory prayers at Mass, basically, asking God for things. One in a hundred will talk about mental prayer, meditation, Lectio Divina, and their power of sanctification. At the same time Catholic sacramental awareness has grown, the interior life, the life of prayer the meaning of which used to be commonly and intimately known by nearly all Catholics, has diminished to nothing. Why do we go to Mass on Sundays, or even during the week, even make our weekly confession, and still struggle with avoiding venial sins? Why do we fight with our friends or families, why do we neglect our duties or retain the thousand and one faults that weaken us and weaken the Church? The Church’s treasures of spirituality, classical mystical theology, have mostly been closed to the lay faithful for a long time. I don’t mean just since Vatican II. In fact, I think it has been so since Trent reoriented the Church into a permanent state of combat with heresy and modern worldly errors. It has turned us into sacramental rigorists who don’t know how to pray. Or even why we should. Why did Our Lady come to earth in 1917 and tell us to pray the Rosary every day? In a lecture recently, Fr. Ripperger said it was so that Catholics would start meditating on the life, Passion and Resurrection of Christ for at least 15 minutes a day. And that Our Lady knew that this was the only way to win. But this makes no sense to us. What’s so important about sitting down and thinking about things for 15 minutes a day? What difference could that possibly make to anything? Maybe it’s a kind of therapy. Maybe, we admit, such a practice would make us feel better. Or even be better. But change the world? Save us from the doom we all now see coming? Don’t we really assume it’s wasted time? We modern men of worldly minds and business, of doing and activity, who have had NONE of the teaching on the path to sanctity that was known to our ancestors in faith. But let’s assume that the teaching of ALL the saints, of the Queen of Heaven, of our Lord the King of the universe, through Whom and for Whom all things were made – is correct. Let’s just assume for argument’s sake that Catholicism is true and we haven’t been lied to by those eminent persons. How then exactly does prayer “work”? Why did the most “effective” of the saints – the ones who founded universities, great religious orders, who went about the Spanish countryside dropping Carmels like seeds everywhere – all say the same kinds of things about prayer? How did an Alphonsus Liguori or a Francis de Sales or Philip Neri spend hours each day in prayer? And what does that mean, anyway? “In prayer“? How long does it take, anyway, to say a Hail Mary and ask for what you want? Even where a habit of vocal prayer endures, where people still say novenas or carry holy cards around… how on earth does one spend an hour, or two or five, “in prayer”? I started asking these questions some years ago. I wanted to know how one really, for real, “becomes a saint”. What is “mysticism” anyway? I don’t, of course, mean the kind one usually hears about, even in modern “Catholic spirituality” books. I mean, what did the Church teach about it until the ’60s came along and made everyone go crazy? What, in short, was the real thing? These are questions I’ve only begun to explore myself. I wanted to know, my whole Catholic life, what sanctity really is and how you get there. I looked at the saints and they seemed to live in another universe from mine. I thought a lot about the martyrs; what was it that could make that possible? So I started buying books, and asking around. I became an oblate in order to try to learn it, like the mystic secrets of a lost ancient civilisation. We’ve lost a lot in the last 100 years. In fact, we’ve lost a great deal since 1545. So much that we have forgotten even what we’ve forgotten. We don’t even ask the question, “What is prayer?” because we don’t know enough about it to know that we don’t know. So, this is what I propose to focus on. I’ve shut off Twitter and I think symbolically shut off my interest in “following the news.” Some time ago a friend of mine entered a Carmelite monastery in the US. She said she wanted to try to keep up with the news while she was inside, the nuns needing to know what they were praying about. This was something that I didn’t really agree with. What did they need to know other than what they already knew? That there is sin, that sin is terrible, that things are dark and getting worse. What was a daily update on the fine points, the daily horror show, going to tell them? It’s a temptation, I think, to “try to keep up,” to stay on top of it. For me, anyway, it took all my attention. I found I could hardly take my eyes off it, like watching a giant flaming asteroid coming at us out of the sky, I was transfixed by it. It overshadowed everything. Or, perhaps, cast a lightless and livid demonic glow over everything. It was colouring everything in my life, and most importantly drowning out with its constant barrage of shouting any hope I could have of hearing the voice of God, still and small as it is. If today you hear God’s voice, don’t drown it out with the racket, the constant shouting match, on Catholic Twitter. I’ve got a bunch of books, most of them old and out of print, I’d really like to try to read, and maybe share some of it with whoever still reads here. I thought of shutting down this blog and starting another that was just about “spirituality”. But I think people think spirituality is dull, and the news and the Vatican horrorshow is, or appears to be, very exciting and interesting. I certainly wouldn’t be interested in reading long tedious posts about dead theologians, and don’t propose to bore myself by writing them either. When I became an oblate, I thought I was set to make the deep dive. But it turned out that oblation isn’t a magic formula, and I mostly just carried on exactly as before. You don’t change your habits just by turning up at the basilica and saying the words and signing the document. Maybe I’ve been given the grace of losing interest in All That Stuff. Lately when people try to talk to me about the latest, I just can’t stand to listen to it. I definitely can’t stand to read it; can’t force my eyes to follow a line of internet-text about it all. And I think we’ve done what we set out to do, five or nearly six years ago, all of us who started sounding the alarm back then. I really think that part of the task is mostly complete. So, I’m just going to change things here a bit. We’ll see what can be done about figuring out, concretely, how to fill the gaps in the day between watching the Vortex and writing letters to bishops. We’ll dive into those books I mentioned, and maybe talk to some people and see what they say. We’ll try to unearth some of the buried treasures, so long lost we’ve forgotten they’re even there. The question is being asked: What do we do? Prayer gets pretty short shrift these days because I think most people just flat out don’t know what it is. I know I don’t. They think it’s not the same thing as “doing something,” and I certainly suffer from this feeling of unease about it. Let’s see if we can fill out the picture a bit together. I want to know what’s in those books; I hope others will be interested too. I hope I can break the habit of 20 years and stop chasing after the Latest Big Thing, long enough to grow, at least a little, in holiness. Otherwise, what’s the point? I hate this. Asking for help is the most difficult thing in the world for someone who has been self-sufficient for a long time. But the truth is, in order to keep doing this I simply have to keep the lights on. Many sincere thanks to the 40-odd readers who have donated in the last week. I hope I can continue to be useful to you. Anyone else interested in the new direction, I hope you will stay with us and that it will be beneficial. Please consider making a donation today. Click here.